Jennifer and I were watching The Sound Of Music movie a while back, and like often happens after a movie is over, we wondered if it was based on a true story or not. 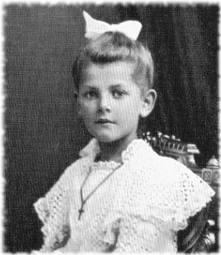 The true story of The Sound Of Music starts when Maria was just a child, where even at a young age she didn’t have a place where she belonged. Her mother had died when she was 2 years old, and her father didn’t want her around so he always made sure she lived with other people. Eventually she ended up in the care of her Uncle Franz, but maybe ‘care’ isn’t the right word. Uncle Franz would go out of his way to punish Maria for anything and everything, or even nothing. Sometimes if she even dared to pick a flower on the side of the road on the way home from school Uncle Franz would use it as a reason to punish her. This kind of treatment would make most kids become shy, but for Maria it just made her more free spirited. She figured that if she was going to get punished anyway then she might as well try to have fun. Maria developed an outgoing (and sometimes loud) personality, and loved being in groups of people. But despite all this, she still felt like she didn’t belong. There was, however, a building where she could find a bit of solace. It’s hard to imagine it now, but in the time and place that Maria grew up music could be very hard to find. Sure you could sing to yourself, but if you wanted to hear great music made by other people you had to have money to go see live concerts. For a poor girl like Maria that left her with only one other option: church. She wasn’t very religious at the time, but she was still drawn to her local church because there she could listen to the most amazing music she’d ever heard in her life. And she loved music with a passion. Each Sunday she’d sit in her seat and just soak in the music, and over the years the message of the church soaked in as well. One Sunday Maria decided to dedicate her life to religion by becoming a nun and joining a convent. By this time she’d developed a big personality, and doing things full blast as usual she didn’t just join any old convent …she entered the strictest convent available to her. This, she figured, would show just how dedicated she was. But things didn’t work out exactly as she had hoped. Like in the movie, the free spirited and outgoing Maria was quite a shock to the strict convent. She ran around whistling loudly, sometimes giggling and skipping, even sliding down the old bannisters in the (once) quiet convent halls. The other nuns admired her dedication to the church but one thing was for sure, she didn’t belong. It wasn’t long before Maria found herself …volunteered… to take a break from being a nun and work as a live-in teacher for a local family, the Von Trapps. In the movie Maria first meets the Von Trapp family when the stern and harsh father Mr. Von Trapp, aka ‘The Captain’, calls his kids with a little whistle from around his neck and they all line up like soldiers. Turns out that the real Mr. 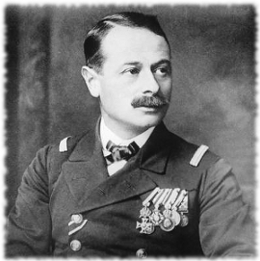 Von Trapp did actually call his kids with a whistle, but otherwise was a very gentle and easygoing father figure. His first wife had died some time before and he was a single father of 7 children. Unlike in the movie, the Von Trapp children already knew about music, but Maria brought them out of their shells by taking them on outings in the country where they would all play and sing. And most importantly, she brought a joy to the household that handn’t been there since their mother died. Mr. 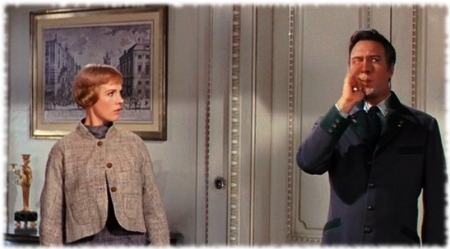 Von Trapp saw how Maria made his kids happy so he decided to pop the question. Maria however, didn’t like him that way. Instead of saying yes or no, she panicked and ran back to get the advice of the head nun in the abbey. 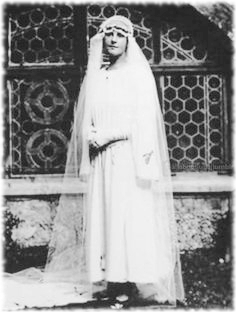 Perhaps not real excited about the idea of the free spirited Maria back at the quiet abbey, the head nun told her that it was “God’s will” that she marry Mr. Von Trapp. And so the strictly religious Maria agreed to get married. On her wedding day she was fuming, she felt angry at God and her new husband because really, all she wanted to do was be a nun and sing in church. The kids weren’t exactly thrilled about the marriage either. They loved Maria but they looked to her as a sister, not a mother. While Mr. 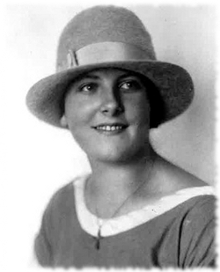 Von Trapp was 47 years old, Maria was 21 …only a few years older than the oldest of the Von Trapp kids. Yeah, talk about awkward situations for everyone. To make things worse not long after the marriage, the bank the wealthy Von Trapps used completely failed. All their money was now gone. Mr. Von Trapp refused to get a job, however, because he felt like it was below his status to work for a living. Maria knew that she had to do something so she seized control. She saw an opportunity for the family to earn a living doing something good so she pushed them to keep singing. A lot. Soon 6 hour singing lessons became a regular part of life and the family was performing concerts across Europe. Audiences loved the Von Trapps, the wholesome, devoutly religious family who sang so beautifully. The problem was, so did Hitler. He had already been pressuring Mr. Von Trapp to come over to the Nazis and be a captain of one of their submarines, but with the rising fame of the entire Von Trapp family the pressure to join the Nazis was drastically increased. 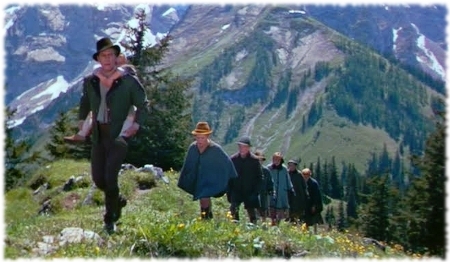 In the movie the Von Trapp family is shown making a daring escape from gun-toting Nazis and climbing through the mountains. Their real life escape was very different though. With suitcases in hand they crossed the train tracks near their house, then simply walked to the train station. Still, they were absolutely crushed. They had to leave behind their home and everyone they knew, or else end up in concentration camps. Their only hope now was in music and in Maria’s ability to help them make a new life in America. In many ways life on stage was perfect for Maria’s outgoing and loud personality. She pushed the family to keep touring and doing musical performances, both in America and in countries around the world. 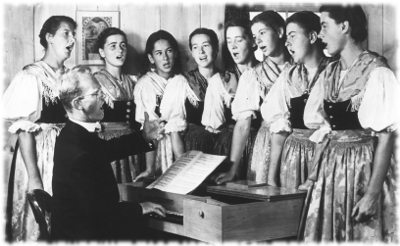 And month by month the Von Trapps slowly built a new life for themselves through music, with Maria at the helm. Once homeless, they now could be at home anywhere their tour bus could go. And with their earnings they were able to build a huge house for themselves in a beautiful part of Vermont, which reminded them of their home country. 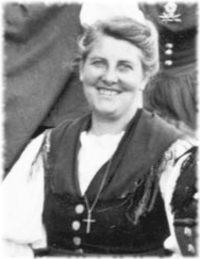 People around the world absolutely adored the singing Von Trapp family, especially the mother and spokesperson of the group, Maria. She had finally found a place where she belonged, and the best part was that she could sing to her heart’s content. 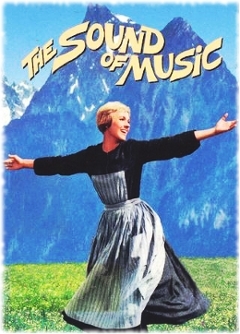 Eventually a movie was made in America about her incredible life story, The Sound Of Music. As outgoing as ever, Maria showed up while the movie was filming and talked her way into getting a small part in the movie. 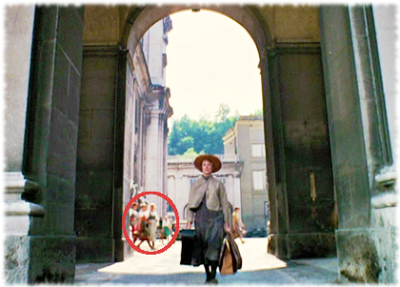 She and her daughter can be seen walking across the archway as Julie Andrews walks to the movie version of the Von Trapp house. How far she had come from when she herself walked the road from the convent to the Von Trapp house for the first time, feeling unsure of what the future would bring …and no doubt humming a song :).